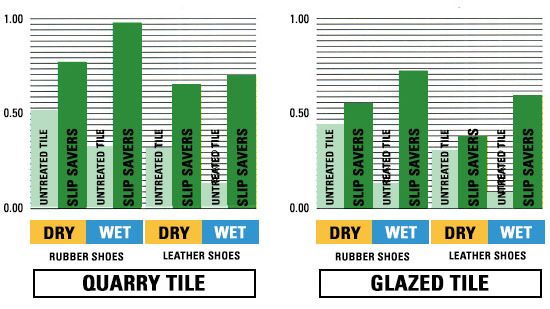 A walkway surface treated by SLIP SAVERS is actually safer in a wet condition than a dry, untreated surface. The products used by SLIP SAVERS have been evaluated according to industry standards adopted by the American Society of Testing and Materials (A.S.T.M.). In accordance with A.S.T.M. Procedures C-1028-1894, once treated, our products create a safe walkway surface on quarry tile and glazed tile in dry and wet conditions. (A static anti-slip coefficient of friction of .50 or above is considered a safe walkway surface with a dry condition.) In fact, the SLIP SAVERS treatment increases the co-efficient of friction 200-400%. SLIP SAVERS does not use a film or a coating that can discolor, crack and even peel off. Additionally, our treatment does not does leave any chemicals, grit or residue on the surface of the floor or bathtub/shower. Once a surface is treated, 100% of the solution is neutralized and then removed. A SLIP SAVERS treatment will not cause chipping, peeling or discoloration. In fact, once done, a floor and bathtub could actually look brand new again. Every floor and bathtub/shower treated by SLIP SAVERS is guaranteed to have an increased coefficient of friction for at least one year. And we back it up with a written guarantee.